(주)휴먼아이씨티 서울특별시 강남구 강남대로 310 (역삼동) 유니온센터 1007,1008호Copyright © 2017 HumanICT Co., Ltd. All Rights Reserved. 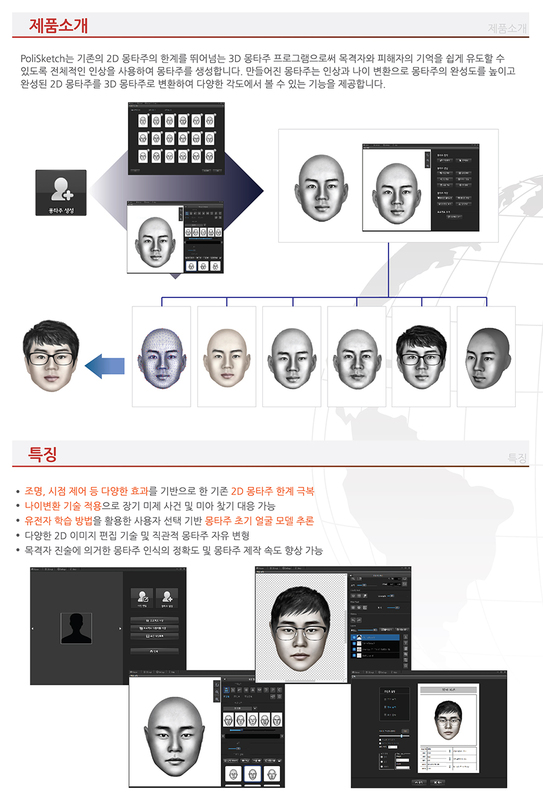 3D얼굴인식시스템(FRS – Face Recognition System) CCTV 등의 영상 처리 장치에서 촬영된 2차원 얼굴 영상과 3D 검색 DB 간의 매칭을 통해 신속하게 대상자 후보 군을 검출할 수 있는 시스템입니다. 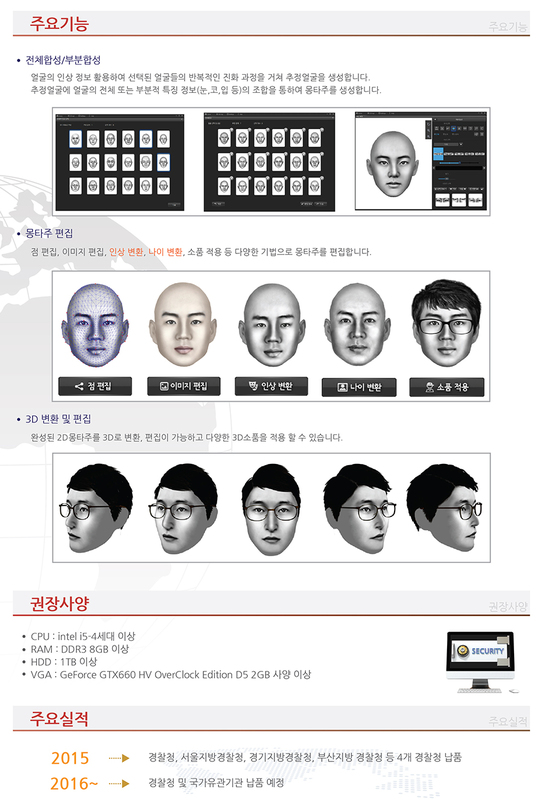 3D얼굴인식시스템 (FRS)은 검색의뢰/검색실행/결과관리 등의 업무를 처리할 수 있는 Web 포털 서비스와 검색의뢰 사진의 1:1 비교 및 1:N 검색 결과를 도출하는 기능과 변환된 3D 얼굴영상을 검색 DB로 저장할 수 있는 DBMS의 기능을 제공합니다. 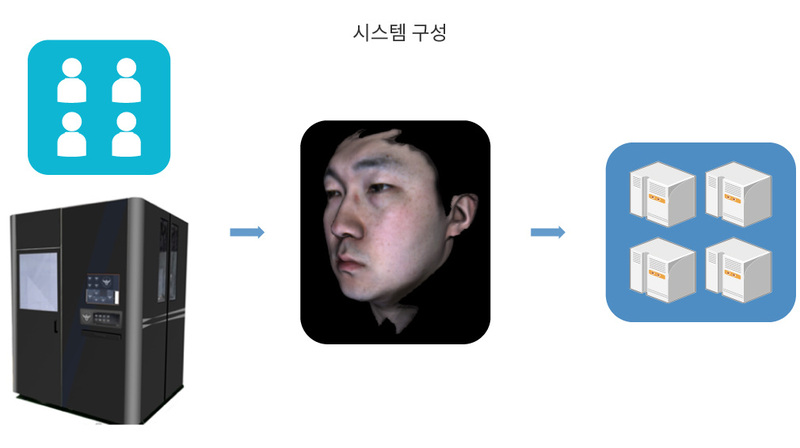 측면 얼굴의 특징을 DB 화된 3D 모델과 비교하여 후보군 검출이 가능합니다. 획득한 사진의 화질이 낮아 판독이 어려운 경우 판독이 가능한 수준으로 화질을 보정할 수 있습니다. 얼굴 부위별 주름, 질감 및 형태 정보를 활용하는 자동 나이 인식 기법을 활용한 기술을 적용하여 입력 사진 얼굴의 연령대를 인식합니다. Visitor management, anti-entry / exit management, vehicle management, pass control, photo taking in consideration of effective security management of domestic automobile group company integrated research institute (improvement of security, standard procedure for responding to personal information protection law, improvement of visiting customer inconvenience) , Management of procedures, and management of conference rooms. 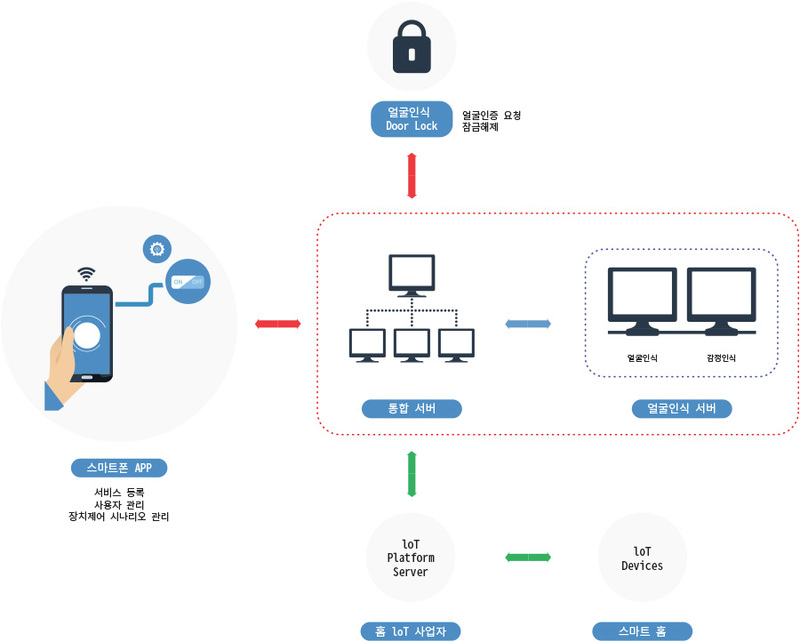 We are also working on the security and security portal system for accessing Hyundai Motors and Group companies through solution standardization. 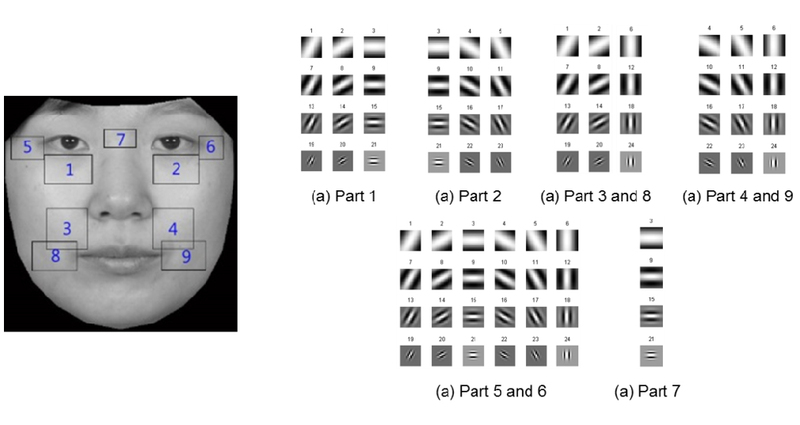 FaceView3D (3차원 영상 생성 및 관리 소프트웨어)는 대상자의 얼굴을 3D영상과 2D데이터로 촬영이 가능한 시스템으로써, 이렇게 촬영된 데이터를 서버로 전송시켜 데이터베이스로 활용할 수 있도록 만들어주는 소프트웨어입니다. 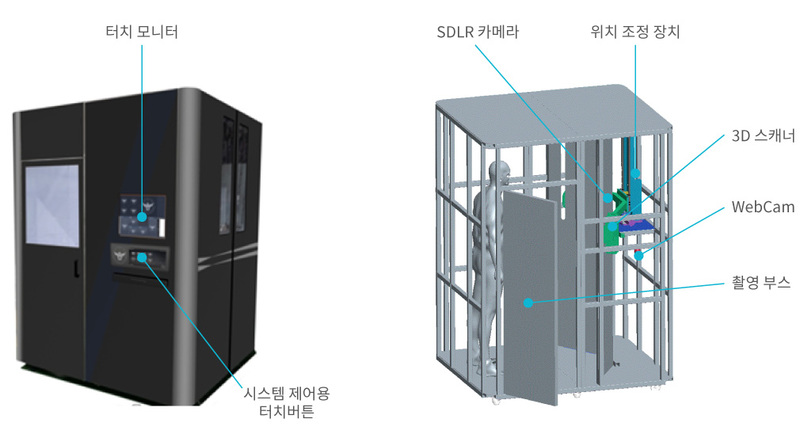 3D 얼굴영상 촬영시스템은 촬영부스, 터치패널, 2개의 3D스캐너, DSLR 카메라, 웹캠, 키호스크, 터치스크린로 구성되어 있습니다. The Smart Video Analysis System overcomes the limitations of visual surveillance by the monitoring personnel of the existing CCTV Integrated Control Center and prevents the decrease in the efficiency of control due to frequent false alarms. It is an intelligent system that quickly and accurately detects alarm situations through Video analysis platform and Video analysis operation system. The system is implemented by the Spring Framework and provides a development environment that can be effectively programmed by developers and future maintenance personnel. The e-Security System supports the establishment of optimal operational process system for access security of the unit business sites and research institutes in each corporation. It provides effective access security operation through experience of access security in various industrial fields and experience in construction of general affairs system. Management of passengers, management of passengers and passengers, management of passages, photographing, management of medications and conference rooms, and management of passengers with consideration of effective security management (improvement of security, reflection of standard procedures for responding to privacy laws, Security management and other functions to enhance the level of corporate security management, raise employee awareness of security, and provide efficiency and user convenience of handling security management tasks.